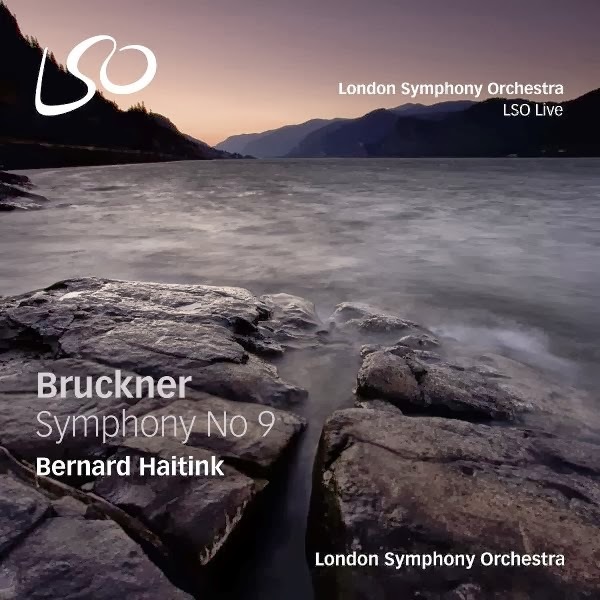 I’ve mixed feelings about this new Bruckner Nine from Haitink and the LSO. Haitink regularly conducts Bruckner in London, usually with the LSO, but often with visiting orchestras as well. And these performances are almost always major events. Haitink has a lifetime’s experience behind him with this repertoire, and he works well with the LSO. He knows how to pace the music, creating continuity but without ever sacficing immediacy. His tempos are slow, and rubato is moderate, with Haitink using carefully-sculpted phrases and emphatic attacks to create the punch that other conductors achieve with faster and more erratic tempos. And it all really works in live performance. That may be a result of Haitink’s ability to maintain the atmosphere of the music over long stretches, and to carry the audience with him. For some reason, though, it doesn’t seem to transfer well to disc. His 1960s Bruckner cycle with the Concertgebouw on Philips isn’t one of the greats, nor is it his best work from the period, although his interpretive integrity there, and the quality of the orchestral playing, is beyond question. Being a live recording, this new Bruckner Nine falls somewhere between the experiences of hearing Haitink’s Bruckner live and hearing his studio recordings. Those slow tempos are not quite as convincing from a distance, and it is more difficult to stay in the mood. In many passages, especially in the Adagio, what should seem transcendent and mystical (and may well have done to the live audience) instead just seems slow and uninvolving. Not everything here suffers so. The orchestra plays well and there are many moments when everything really comes together. The conclusion of the first movement is as thrilling here as on any recording, the focussed, penetrating sound of the timpani driving the music on. And in the Scherzo, Haitink demonstrates his rare ability to give the music drive and focus, but through accentuation rather than speed. The tempo here could seem perversely slow under other conductors, but Haitink is able to draw grandeur from this music, and without compromising the energy and feeling of momentum. The dry acoustic of the Barbican has long been the Achilles’ heel of the LSO Live label, and it is more of a problem in Bruckner than in most repertoire; you get little feeling for the “cathedral of sound” quality of the music. On the other hand, Haitink compensates somewhat through his expansive tempos and the broad sonorities he draws from the orchestra. Coupled with the superior audio, and the fine orchestral playing, the acoustic does allow us to hear more detail than in many recordings, not that Bruckner’s orchestration requires all that much analytical listening. In recent years, the London Philharmonic has been making great efforts to be seen as the leading Bruckner orchestra in the capital. On their own label, they have released superlative Bruckner readings under Tennstedt, Eschenbach and, most impressively, Skrowaczewski. The LSO’s long-standing partnership with Haitink is another strand in London’s recent relationship with Bruckner, and this disc is valuable for documenting the more recent fruits of their collaboration. But, at least as far as recordings are concerned, the London Philharmonic retains the upper hand in this repertoire.